Seniors need to make ends meet, but the best dividend stocks can do even more. Here are three to consider. Retirees have a lot to balance when investing. If you're one of them, not only do you have to make sure to protect your capital to cover short-term expenses, but you also have to make sure your investments are generating income and delivering growth for the long term. In other words, it's a difficult mix of balancing your needs for today, and for tomorrow. 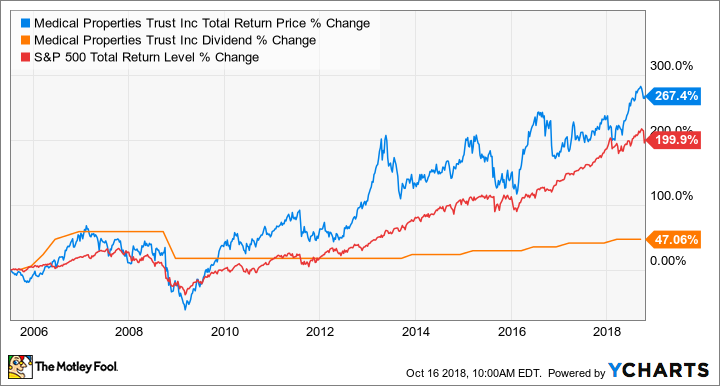 So we asked three Motley Fool contributors who've spent years researching and writing about dividend stocks to give us their top dividend stocks for retirees. These stocks need to pay predictable dividends, but also need to grow the payout over time. They should also have prospects to grow the business, so that as retirees age, they can have a bigger nest egg to tap if necessary. These three dividend stocks should help you protect your nest egg. Image source: Getty Images. They came up with two healthcare real estate specialists and a renewable-energy producer now being managed by a global infrastructure behemoth: Physicians Realty Trust (NYSE:DOC), Medical Properties Trust Inc. (NYSE:MPW), and TerraForm Power Inc. (NASDAQ:TERP). Keep reading below to learn why these three made the list as being ideal dividend stocks for retirees. Matt Frankel (Physicians Realty Trust): Ideal stocks for retirees have relatively low volatility, stable above-average dividends, and room for long-term growth. One stock that checks all of these boxes is Physicians Realty Trust, a real estate investment trust (REIT) focused on healthcare properties, particularly medical office buildings. As of the latest data, Physicians Realty Trust owns 249 properties, most of which are medical offices either on major health campuses or affiliated with health systems. The first reason I like Physicians Realty Trust for retirees is the defensive nature of healthcare real estate. In recessions and otherwise weak economies, people can cut back when it comes to shopping malls and staying at hotels, but medical offices are still well utilized no matter what. Second, Physicians Realty Trust pays a generous 5.8% dividend that's well covered by the income its properties generate. The company hasn't been around long enough to develop a big track record (its IPO was in 2013), but the results so far have been promising. Physicians Realty Trust's funds from operations have risen steadily over the past few years, and the current dividend yield represents just an 82% payout ratio. Finally, healthcare is a big long-tailed growth opportunity. The U.S. population is aging, fast. Over the next 35 years, the 65-and-older population is expected to roughly double. Seniors use healthcare far more often than younger Americans, which should create a steady rise in demand for new medical office properties. Plus, with REITs owning less than 15% of existing properties, there's lots of room for growth already. Matt DiLallo (Medical Properties Trust): Medical Properties Trust has all the qualities a retiree could want in a great dividend stock. Not only does the company offer a generous yield that's currently 6.8%, but that payout is on solid ground and appears poised to grow in the coming years. Several factors drive that view. First, Medical Properties Trust owns a strong portfolio of hospitals and other medical properties that generate very consistent income for the company, which gives it the cash to pay its dividend. Meanwhile, the company pays out less than 70% of that cash flow in support of its dividend, leaving it plenty of breathing room. On top of that, the company has a strong balance sheet, which has grown stronger in the past year after it sold several investments for big-time gains. MPW Total Return Price data by YCharts. Medical Properties Trust's ability to generate excess cash above its dividend, when combined with its strong balance sheet, gives it the financial flexibility to continue investing to expand its hospital-related real estate portfolio. Those future additions should increase the company's cash flow, giving it the funds to keep raising its dividend, which it has done in each of the last four years. That growing income stream makes it an ideal option for retirees to consider. Jason Hall (TerraForm Power): For the first several years of its existence, renewable energy producer TerraForm Power was a frustrating investment that cost many investors money, and seemed destined to never live up to its potential. 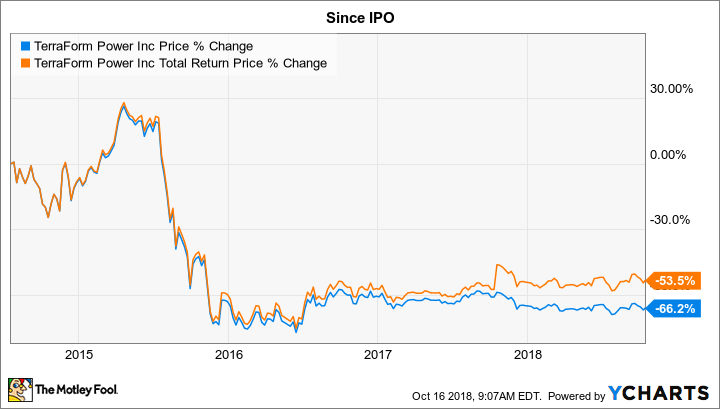 Its struggles were exacerbated by the problems and eventual bankruptcy of its former parent, SunEdison, which cast doubt on TerraForm Power's ability to even survive. But last year, Brookfield Asset Management (NYSE: BAM) swooped in and acquired a controlling stake. Brookfield, a global giant in infrastructure asset management, put new leaders in charge, and has already made substantial changes that have turned things around sharply. The end result is a dividend that's strong -- with an almost 7% yield at recent prices -- sustainable, and well within its ability to maintain. Furthermore, management already plans to grow the payout 5% to 8% annually through 2022, making for an excellent income growth stock. That's only part of it; TerraForm Power's payout will only consume a portion of cash flows, meaning the company won't have to rely solely on debt or selling stock to raise capital to invest in new projects. And with there being as much as $10 trillion in potential renewable-energy opportunities just to replace existing carbon-based power generation around the world, there will be plenty of new projects to develop in the years ahead. With a heady yield, excellent growth prospects, and one of the best asset managers in the business running the show, TerraForm Power is a stock that retirees should feel very comfortable adding to their income portfolio.